and cross the little bridge. In the centre of the village pass the church(on your right). Turn right into Route de la Clemencerie and follow signs for “Les Maugeres”. Pass the cemetery on your right and take the third road on the left, Route des Maugeres. Take the route nationale, N976, direction Vierzon,Bourges. You will pass a sign reading Montrichard 9km. Continue along the N976 for about 6km. At about 3km from Montrichard you will pass a TOTAL garage on the right. Take the next road on the right, Faverolles (about 1km). Follow directions for “Les Maugeres”. Continue along the Route de la Haute Clemencerie. After about 800m. Take the route nationale, RN976, direction Tours, Montrichard. Leave the RN976 at the exit for Montrichard/Faverolles sur Cher. At the first roundabout, take the second exit to cross over the route nationale. At the next roundabout, take the first exit, direction Loches/Faverolles sur Cher. 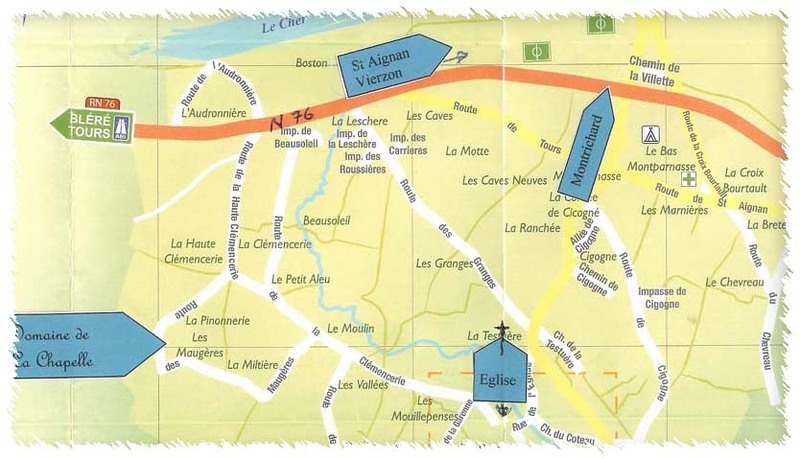 Follow directions for Loches for 1.5km until you see the sign for Faverolles. Take the road to Faverolles and cross the little bridge. is the last house on the right, enclosed within a long wall, opposite the vineyards, Number 1.